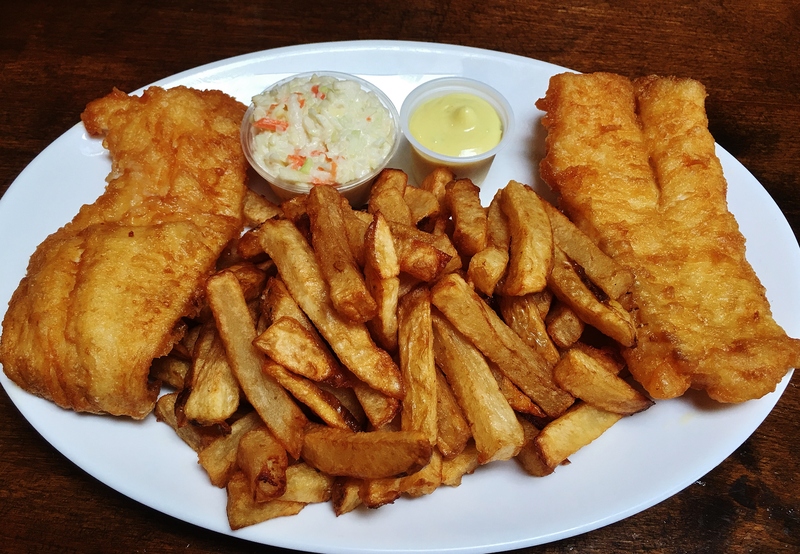 Years ago, Loyola Hearn, our country’s popular Ambassador to Ireland until 2014, told me the best fish and chips in Newfoundland could be found at The Captain’s Table in Mobile. He encouraged me to try it. Of course, he was MP for Mobile and the Irish Loop at the time, but I knew Loyola wouldn’t give me a bum steer. Believe it or not, I’ve just now managed to visit The Captain’s Table to taste its vaunted fish and chips. It’s not difficult to find. 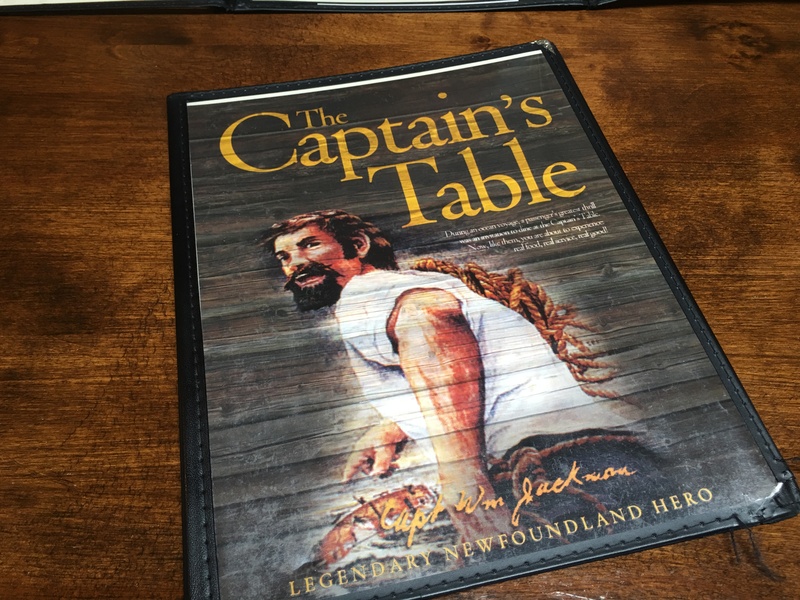 The Captain’s Table is just beyond Witless Bay, almost on the Mobile-Witless Bay border, literally yards from the gravel shoulder of the Main Road. Surprisingly, the red, ranch bungalow looks a little tatty on the outside. It could use lick of paint. This seemed odd in the tourist season. No exterior signs of the restaurant’s nautical theme exist, other than the name, The Captain’s Table. Although, I suppose this could be any kind of captain, not just a sea captain. Army captain, police captain, aircraft captain perhaps? I remember from driving past many times, that the restaurant used to put on a much smarter face. The grass was greener and the paint looked fresh and bright. A large, red, model fishing schooner took pride of place in front of the building. Now there’s nothing left in that spot but scarred earth in the shape of a boat, and the disintegrated bones of the handsome model. Lacklustre outside appearances certainly aren’t putting off customers. We arrived for an early supper, without booking, and were asked by a polite server if we could wait 10 minutes until a table was available. It gave me a chance to read the menu. The beefy hero of the cover was Captain William Jackman. He was from Renews, south of Ferryland and even further south of Mobile. Jackman was a true hero, having saved from drowning 27 passengers of a vessel that ran aground off Spotted Island, Labrador in 1867. I recognized the artwork. It had been on a Canadian postage stamp in 1992, but the image was reversed on The Captain’s Table menu, and its identifying text and denomination removed. We were seated at a booth, made to look nautical, by attaching rigging to the seatbacks – bits of rope and sailcloth – and by placing a porthole, with painted blue ocean under glass, on the booth’s shiplap wall. The entire restaurant had the look of what you might imagine a 19th century sea captain’s cabin to look like, if the captain had had room for, say, 100 guests. 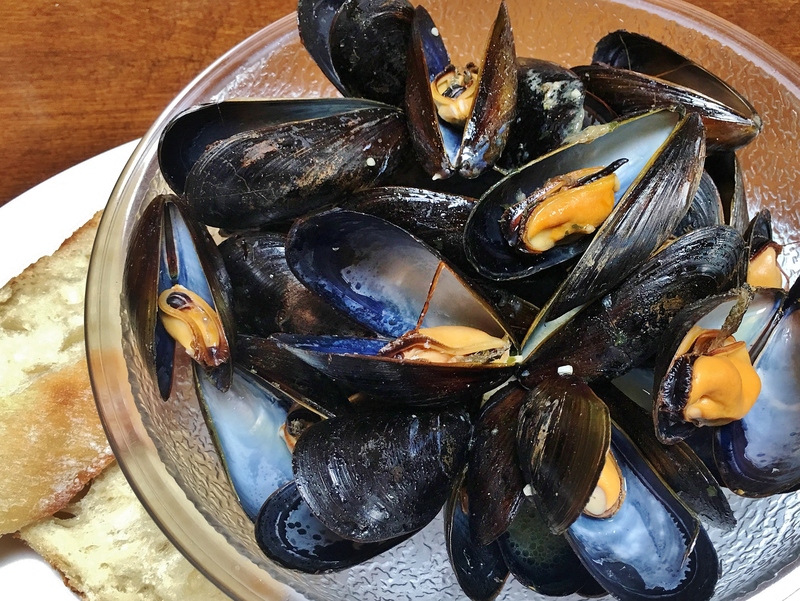 I was torn between having fresh, steamed mussels in garlic butter or shelled, plain shrimp sautéed in garlic butter as an appetizer. Fresh mussels won out. They were orange coloured and plump. I realize that, except for colour, the orange mussels are the same as the white but the orange ones look more appetizing and, thanks to my brain, looking better makes them register as slightly better on my taste buds. 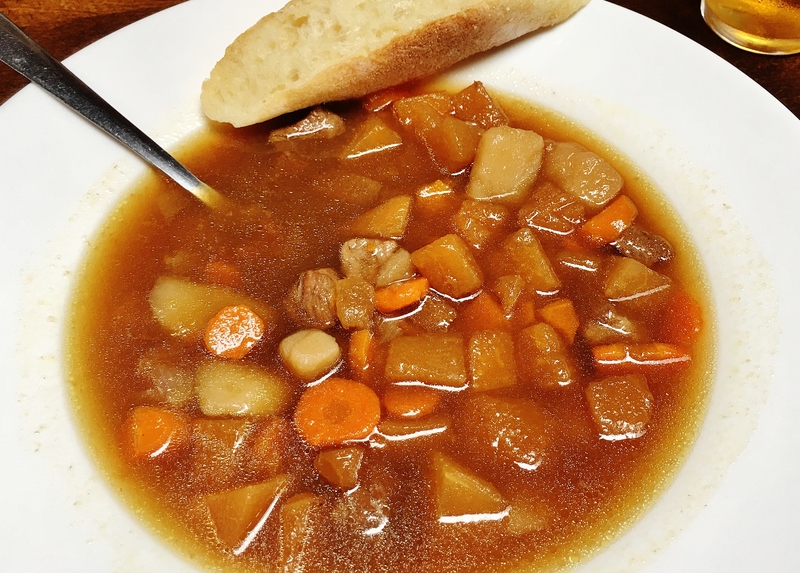 Like many Newfoundland restaurants, The Captain’s Table has a soup of the day, “fresh soup made daily.” It was vegetable beef, consisting of small cubes of beef and large cubes of potato, turnip and sliced carrot. This soup isn’t difficult to make but some restaurants still manage to get it wrong. The Captain’s Table got it right. It was perfectly seasoned and had the big, lip smacking flavour of beef and fresh root vegetables. The fresh, sautéed scallops were good but left on the pan a touch too long. Smaller scallops cook faster. Close attention must be paid. 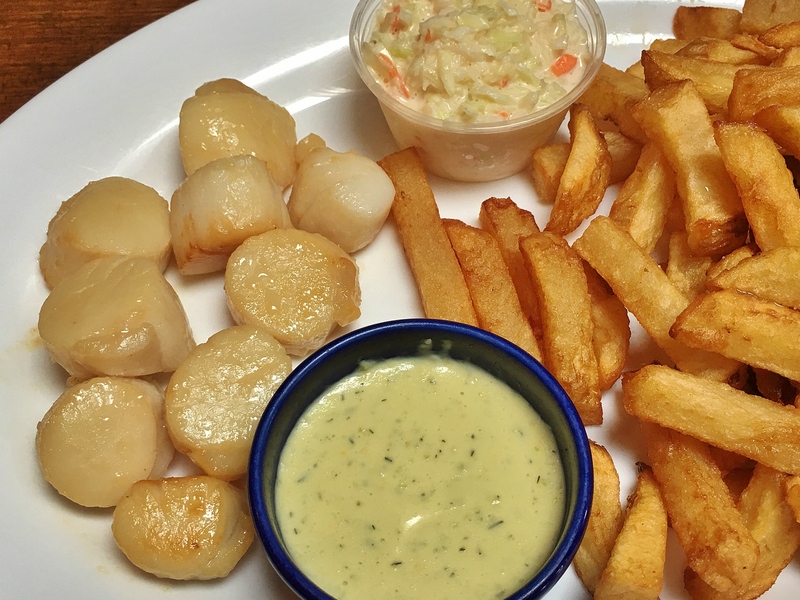 Nine scallops came with dill sauce, coleslaw and fries. The dill sauce was velvety and had plenty of dill flavour. You won’t find better freshly made coleslaw; and the chips were just right. The Captain’s Table did a commendable job on the fish and chips. On the menu it’s called, “Our Reputation Maker,” and I can see why. The white as snow fish was flaky, moist and obviously not long out of the water. Batter can be the downfall of fish and chips but The Captain’s Table did a light batter that turned into a thin, golden, crispy coating. Chips and coleslaw were, again, very good. House-made, and very smooth, tartar sauce impressed as well. 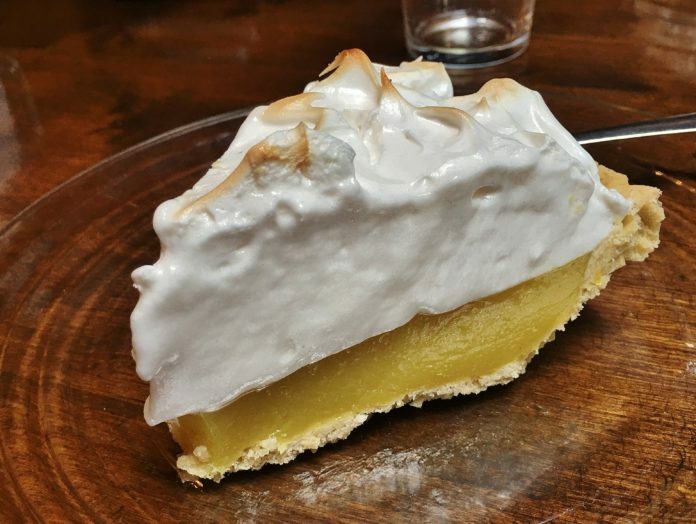 It’s rare for a local restaurant to make lemon meringue pie from fresh lemons. Not only that, The Captain’s Table lemon meringue pie was made without dairy and eggs. It was full-on, full-blown vegan. In fact, many of the desserts were vegan, from pie to cheesecakes. The omission of eggs and dairy from lemon pie filling means you either find something with similar creamy texture – like silken tofu – to replace them, or, you make a firm, corn starch thickened lemon filling. The Captain’s Table made a firm, zesty, very lemony filling, supported by thin, flaky pie crust. Vegan meringue can be created with chick pea water – from tinned chickpeas – or by using commercial egg substitute made with tapioca and potato starch. I liked the pie but prefer egg meringue. I’m still wondering why a restaurant with virtually nothing vegan – except garden salad – on its menu, would serve so many vegan desserts. I am certain about one thing. The Captain’s Table makes excellent fish and chips. 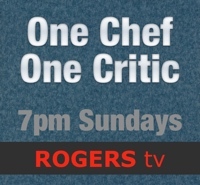 I can’t go as far as Loyola and say it’s the best in Newfoundland but it’s surely in the running. Price Dinner for two with beverage, tip and tax costs approximately $100. Open Saturday and Sunday: 8 a.m. to 8 p.m. Monday to Friday: 12 p.m. to 8 p.m. Beverages Highballs, cocktails, house wine, domestic bottled beer, draft beers, liquors, soft drinks, juices, tea and coffee. Best bets Soups, mussels, fish and chips. Wheelchair access Not totally. There’s accessible parking. The main entrance may require assistance with the door. While booths are inaccessible, tables can be accessed. Restrooms are not accessible.